There is an excellent video of the first shakedown test of the Ferrari F2008 on Axis of Oversteer - it's well worth watching, absolutely fascinating stuff. And not just for the car; there is more footage of Kimi Raikkonen in a working and relaxed environment than I have ever seen before. He is revealed as quite human, composed, cool, calm, but not as withdrawn as we imagine. In fact, were it not that we recognize the face, he could be anyone, the man on the street. Only the air of complete confidence might alert us to there being something different about the guy. Massa makes a few brief appearances, too. And he seems pleasant enough, although there seemed no interaction between the two drivers. Maybe it's my imagination, but I detected an atmosphere of moody petulance about the Brazilian, even when he was smiling and shaking hands with the crew. Perhaps he was a bit annoyed that it wasn't going to be him driving the car that day. There were others present, most noticeably Luca di Montezemolo. He is very interesting to watch - the consummate politician, greeting everyone and observing proceedings with a benign and paternal presence. Yet was there a suggestion of more warmth in his greetings for some, rather than others? It's a fascinating pastime, this Ferrari watching. There were even walk-on parts for some of the stars of yesteryear, Jean Todt embracing Kimi with Gallic kisses and Michael Schumacher wandering in to stand around doing nothing - just part of the team, you know. The car itself was pretty in the pit and superb on the track. It was a foggy morning at Fiorano that day and there was something inspiring about seeing Kimi screaming down the straight into the greyness, then materializing further away as a vague shadow accelerating and braking through the curves, and always with the music of the V8 to accompany his progress. Atmospheric stuff. But I am no Ferrari worshipper, as my readers know, and a terrible thought occurred to me as I watched the video. This is true heresy, the kind of thing that invites lawsuits from the FIA, but does the testing limit apply to Fiorano as well? And, if so, how is it policed? Since Fiorano is Ferrari's own testing facility, it is difficult to see how the FIA could keep an eye on it all the time; what is to prevent Ferrari from using it whenever they want to? Indeed, does that shakedown test count towards the year's total allowance for the team? While the Fiorano test was happening, McLaren were testing the MP4/23 at Jerez - no luxury of their own test circuit for them and no possibility of hiding a few unofficial runs, therefore. Pardon me for even thinking it, but this must surely be an area where the Italian team have an advantage over the rest. And that is nothing new - Ferrari have used Fiorano for decades and it has been recognized as a priceless advantage. It is only such strange introductions as the testing limit that bring the private facility into question. If limits are imposed in any area, it is only right that they should apply whether a team has special arrangements or not. Shakedown runs are a part of the testing limit, but rather than bulk them in with the mileage restriction, I believe they just say "two limited (10km) shakedowns allowed per chassis" or something similar and to that effect. I believe Ferrari's Fiorano testing is included in the limit as well, and it isn't actually that hard to police. The parts on the cars have shelf lives, determined mostly by the mileage. Also, these parts have unique numbers to help with identification. If Ferrari turned up at an event and the FIA inspected a particular part and found 1000km had been added to the life without obvious reason, I think some people might get suspicious. Cars must be fitted with the FIA ECU required by Article 8.2 of the 2008 FIA Formula One Technical Regulations. I presume that control unit records mileage. A good point though Clive. I believe Ferrari used to get away quite a lot in the past. But other teams, who are perhaps just as wealthy and just as much a part of Formula One's future, are voicing their concerns and not allowing quite as much to be brushed under the carpet. Great video though, isn't it? Really interesting to see Kimi in his working environment. Kudos to Axis of Oversteer for posting it. I think the most interesting thing is Schumacher's behaviour when Kimi brings the car in at the end. He looks like a caged lion. To me he is desperate to get out and try it. I really don't understand why he retired and why he doesn't come back. If he is giving the commitment and is still prepared to test why not do the fun part? Is he really afraid Kimi might beat him? When he was asked recently in a press conference whether he would ever return to racing, Michael answered very firmly, "No." That seems a very definite answer from someone who is torn between retirement and a return. I would guess that Michael's motives go deeper than anyone suspects and that we may never know them. It is strange to see Kimi in that environment. Many people felt that Mika Hakkinen was closed, cold and non-emotional. But some footage shows quite the opposite. The famous video of the water fight during a post-race press conference, footage of him with his family and the fact that he is human paid ends to the thoughts. But when in a car, in his day job, Mika was cold and calculated. Only speaking when necessary. Much like Kimi, take Mika away from a racing car or a grand prix situation and you realise he's a vodka-drinking, fun-loving party-animal*. I've heard a fair few stories about Nick Heidfeld that would blow socks off some fans. 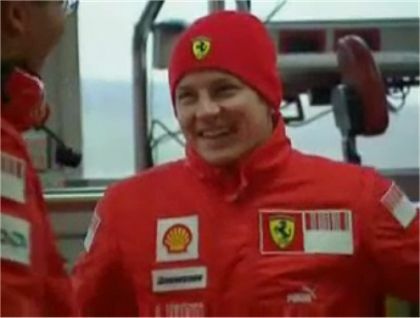 It's nice to see Kimi relaxed, at home in a cold Italian pit garage. I think the title from '07 would have finally made him realise there is life after McLaren, and hopefully Ferrari now see that Kimi is clearly their replacement for the man who crops up in the video, hugging Montezemelo a lot more warmly than the greeting Luca had with Jean Todt. I agree, Ollie, it was very revealing to see Kimi in an unpressurised environment, reacting normally and with warmth to those around him. Although he likes the Ice Man image, I think he is probably one of the nicest guys on the grid, on the video evidence. Further to Ollie's comment about the test mileage, the ECU is supposed to measure mileage. However, this only works if Ferrari a) install the ECU in the cars when they test and b) hand over the data, unmodified, to the FIA when they've collected all the test data. a) should be easy to check unless they manage to keep testing a complete secret. Luckily for the FIA, the likes of Axis of Oversteer will make sure this is not the case. b) is quite a lot more difficult - all it would take is a clever hacker at the Ferrari end to get through whatever security systems the FIA have chosen to use and alter the data. - Demonstration or promotion runs with supplier-provided tyres (so the city-centre events you sometimes hear about are not considered testing). You can do as many demos or promotional runs as you wish, and I would say this is good for F1. - "Young driver testing" for anyone who has neither competed in F1 nor done more than four days of F1 testing in the previous 24 months. It's in inverted commas because Michael Schumacher would be eligible for it in November 2008 if he refrains from driving the Ferrari in a race or formal test this year (promotional and demonstration runs, not being tests, do not count). Note that this testing is not limited. Since Kimi Raikkonen has done some racing in F1 in the last 24 months (how else could he be F1 champion? ), and this is clearly not meant to be a demo run or promotional event, this counts as a test. However, 30000km takes some using up. If you assume that a driver does 500km a day (sometimes they do more, but sometimes they do a lot less), then you'd need 60 driver-days to use up your quota. If the average test has two drivers for four days. It's not five days because the teams informally agreed that long tests should be Tuesday-Friday this year to allow race drivers to get from races to testing without getting tired. Then you could do a full seven weeks of testing and still have four driver-days left over. Cheers for the link Clive. Very interesting.